Seven police officers and three good Samaritans have been honored after they rescued a driver from a fiery school bus crash last week. According to reports the bus turned in front of a Ford F-150 in the early morning, trapping the Ford driver inside the wreckage. By a stroke of luck, police corporal James Gerald happened to be just a mile away at the time. 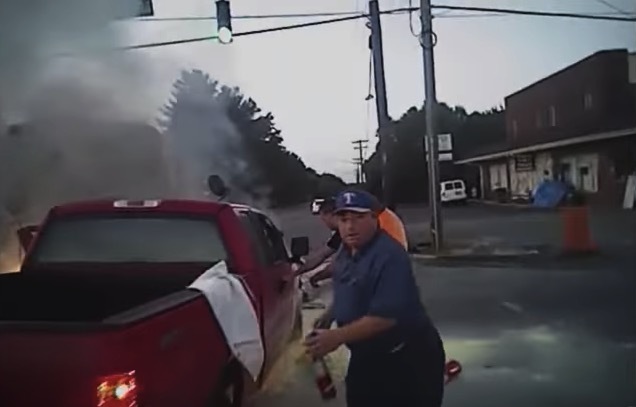 Gerald quickly arrived on scene and noticed the driver of the Ford stuck inside as flames started to encompass the vehicle. Over the next few minutes he fights to free the driver. With the help of 6 other officers and 3 bystanders they successfully pull the driver out just in time. The driver was then taken to hospital with non-serious injuries.